We visited Berwick-upon-Tweed last week, a town where L.S.Lowry spent a significant amount of time over the course of four decades. He visited the town many times from the mid-1930’s, often on holiday with his family, until the summer before he died. This gives me a good excuse to post up some of my favourite Lowry paintings, as part of my series on the Art of Leisure. 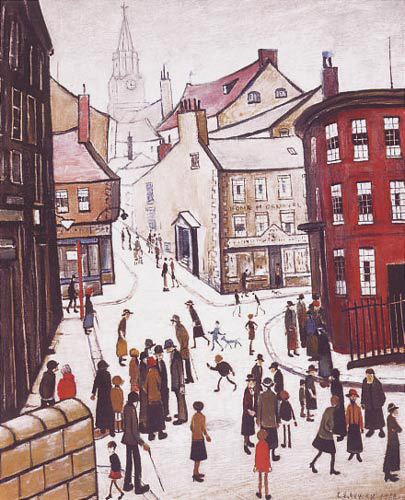 Laurence Stephen Lowry (born Stretford, 1887; died Glossop, 1976) was the only child of Robert and Elizabeth Lowry. He started drawing at the age of eight and in 1903, he began private painting classes which marked the start of a part-time education in art that was to continue for twenty years. In 1904, aged 16, Lowry left school and secured a job as a clerk in a chartered accountants firm, he remained in full time employment until his retirement at the age of 65. His desire to be considered a serious artist led Lowry to keep his professional and artistic life completely separate and it was not disclosed until after his death that he had worked for most of his life. He initially studied evening classes at The Manchester College of Art under Pierre Adolphe Valette a French impressionist painter one of whose specialities was urban scenes of Manchester. Later he learned the art of portraiture from the American painter William Fitz. 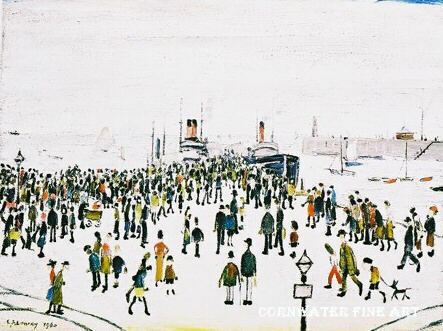 It was from these artists that Lowry developed his trademark of stylised figures upon an industrial background. 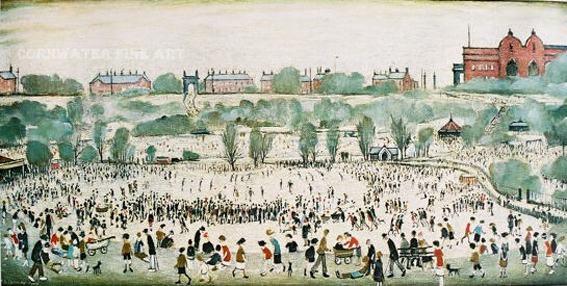 “Going to the Match” 1928, a painting which clearly depicts St. Michael’s Flags and Angel Meadow Park, Manchester. In 1909, when in his twenties, Lowry moved to Pendlebury, where he spent much of rest of his life and drew inspiration from the mills and factories. In 1916, whilst waiting for a train, Lowry became fascinated by the workers leaving the Acme Spinning Company Mill; the combination of the people and the surroundings were a revelation to him and marked the turning point in his artistic career. Lowry now began to explore the industrial areas of South Lancashire and discovered a wealth of inspiration, remarking ‘My subjects were all around me … in those days there were mills and collieries all around Pendlebury. The people who work there were passing morning and night. All my material was on my doorstep. 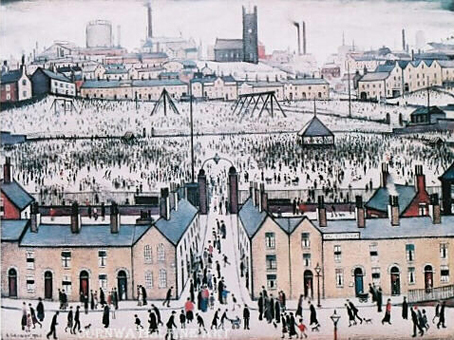 Typical of Lowry’s urban landscapes, this is a vivid record of life in industrial northern England. His use of spindly figures, often termed ‘matchstick men’, have become the best-known feature of his work. In early paintings, each ‘matchstick’ figure was carefully and individually depicted. From about 1930, they became less distinctive – anonymous members of the crowd. 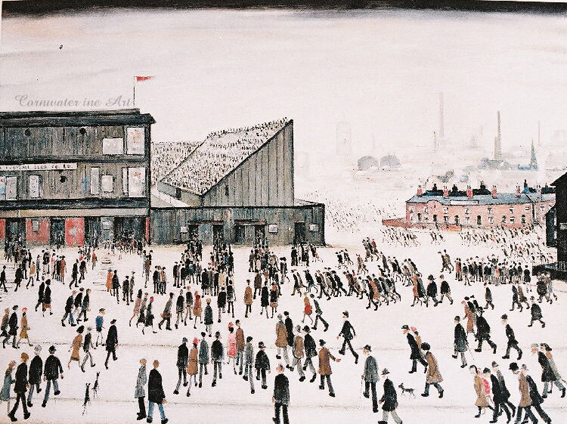 Although he often depicted industrial cityscapes with some affection, Lowry also conveyed a sense of their bleakness. He invariably used drab colours to portray grimy urban buildings and overcast skies, dominated by ever present smoking factory chimneys. This painting portrays the Lancashire town of Daisy Nook in festival mood. Traditionally, mill workers were confined to only two statutory days of holiday every year; Good Friday and Christmas Day. Every year on Good Friday, the town of Daisy Nook would stage a fair and provide entertainment to the local crowds. Managed by the Silcock family, whose name appears in the background of the painting, the fair regularly attracted huge numbers of people and still takes place to this day. 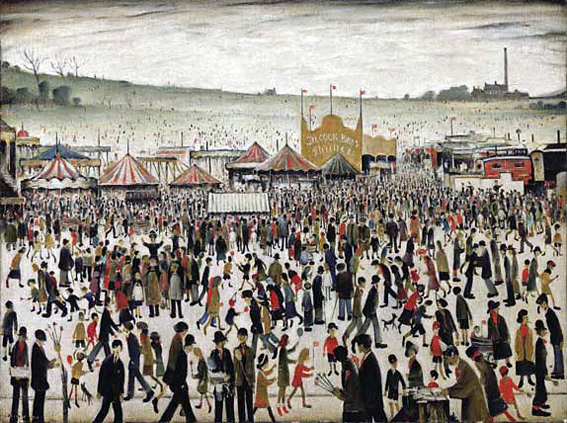 The present painting depicts this annual fair in 1946, the year after the end of the hostilities of the Second World War. The Ashton Reporter stated at the time that there were ‘Record crowds at Daisy Nook’, as people celebrated a return to the fair and a return to normal life. The painting reflects post-war cheer and relief and depicts crowds of energetic, colourful characters, many holding whirligigs and flags. On 8th June 2007 Daisy Nook was sold for £3,772,000, the highest price paid for one of his paintings at auction. Lowry’s street scenes, peopled with workers, housewives and children set against a backdrop of industrial buildings and terraced houses had become central to his highly personal style. From now on he painted entirely from experience and believed that you should ‘paint the place you know’. Lowry’s leisure time was spent walking the streets of Manchester and Salford making pencil sketches on scraps of paper and the backs of used envelopes recording anything that could be used in his work. From his first exhibitions in the 1920s, he built a reputation gradually, only achieving popular success when he was in his sixities, and continued to live a simple and private life. A humble man, Lowry holds the record for turning down the most honours including an OBE. In total he turned down five honour awards and declined the CH in 1972 and 1976. To read more about Lowry it’s worth looking at The Lowry Museum’s website here. And here’s an article in The Observer by Vanessa Thorpe (March 2007) called ‘Lowry’s dark imagination comes to light’. It explores a much darker, sadder group of Lowry work rarely seen by the public, bleak sketches and paintings that include a series of disturbing and sexually deviant drawings. All had remained hidden until after the artist’s death in 1976. Lowry enthusiast Howard Jacobson argues that ignoring the bleak side of the artist’s imagination has led to him being under-rated and misunderstood by many art critics. This entry was posted on Saturday, September 13th, 2008 at 10:10 pm	and is filed under ART & LEISURE, INSPIRATION. You can follow any responses to this entry through the RSS 2.0 feed. Both comments and pings are currently closed.